Happy Monday babes! I hope you all had a fabulous weekend and are ready to take on the week! If you missed my stories on Instagram , then you missed we went to the University of South Carolina football game against Texas A&M. It was not an easy game to deal with by any means haha. I remember when I first started dating John they said we are sorry for making you a Gamecock fan and now, after losing my voice from screaming so much, I finally understand what they mean haha. SEC football is a hard one for sure! Regardless, we had a great time getting spend some of the weekend with my in-laws and catching up with them. We also got to go to the fair which was super fun. I hadn’t been to a fair in a few years, so it was fun to go to the one that my husband grew up going to. We ate elephant ears, fisk fries, and rode a ski lift across the whole thing. It was a good time to just walk around and talk and laugh. In other good news, today is a very special day because today is one of my sister’s birthdays! It is the sister right above me (I have three). Her name is Andrea (pronounced On-dree-a), but we just call her Onge. I am sad I can’t be in California with her to celebrate, but I will be there soon to celebrate. Happy Birthday Ongey! I love you!! Lastly, for today’s post, in honor of fall, I thought I would post one of my favorite fall looks right now. I picked this skirt up from Loft and I absolutely love it! 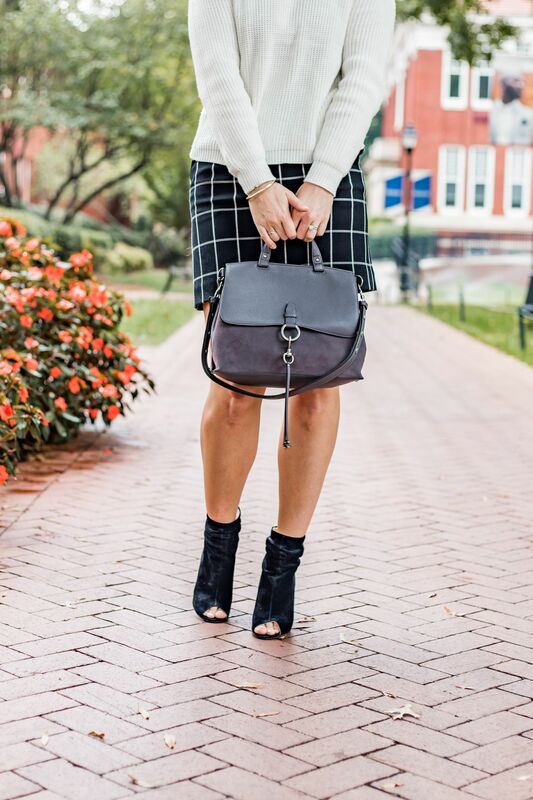 I feel like it is the perfect plaid skirt to transition into fall with. I love this look because I feel like it is super versatile, but very fun and full of the season! I love you too!!! You’re the best!